• Absorbed glass-mat construction... Lowers internal resistance for superior performance. • Individually tank-formed plates... Optimize uniformity of cell voltage. • Epoxy-sealed posts and recessed terminals...Eliminate post leaks. 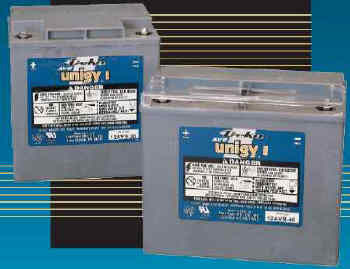 • UL recognized component (UL Approved). • Reinforced case, complete with carrying handle...Resists bulging and meets safety requirements (UL94 V0 / > 28% L.O.I.). • Computer-aided design and manufacturing... Ensures quality products through control of processes and standards. housed in flame-retardant, 12-volt monoblocs. I.C.A.O., I.M.D.G., I.A.T.A. and D.O.T. air transport approved. CONTAINER/COVER: Flame Retardant Polypropylene -Rated UL94 V0 / > 28% L.O.I.